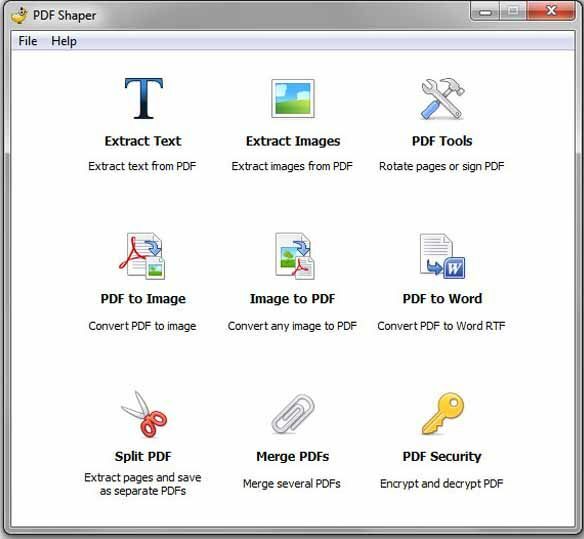 Download PDF Shaper latest version free. PDF Shaper is a collection of free PDF tools, which allows you to merge, split, encrypt and decrypt PDFs, convert images to PDF, convert PDF to Word RTF or images, extract text and images from PDF. Program has easy-to-use user interface, supports Unicode characters and batch processing. PDF Shaper allows you to work with text and images of PDF file. You can extract formatted text and save it in TXT file or convert PDF to Word RTF format. Images can be extracted from PDF as well, also you can convert bunch of images to single PDF file or save every page of PDF file as JPG image. With PDF Shaper you can do a lot of tasks with pages of PDF file – rotate or normalize individual pages, extract all pages or individual pages based on page range, merge and split PDF pages, crop pages using custom sizes. Using PDF Shaper you can update or remove metadata information of PDF and you can protect your PDF files – encrypt with owner and user password, set user access permissions, sign and decrypt PDF files.